We hope this post finds our Canadian and American readers enjoying their Independence Day weekend. It’s important to step back and remember the freedoms we often take for granted. Not everyone is so fortunate. May we always cherish the sacrifices made (and be willing to do the same) to ensure a free society. Because of the holiday, this update will be as brief as possible. We’ve found a fashionable stock on the verge of a firework-like breakout: VFCorp (ticker: VFC). Let’s get down to business. For many years, VFCorp (the parent company of Lee, The North Face, Jansport, Vans, you get the point) was a leader of markets. More specifically, from late 2008 thru mid-2015, VFC outpaced the S&P 500 (including dividends) 4-to-1*. 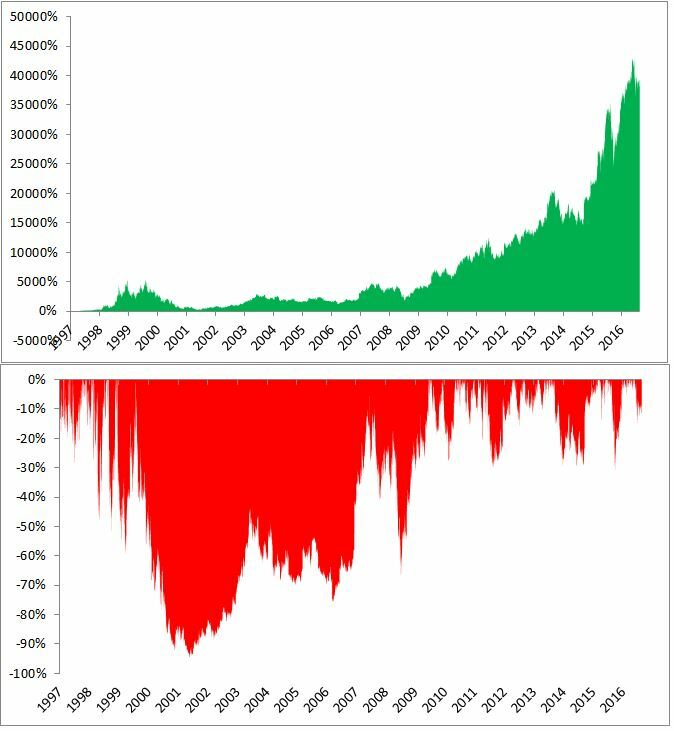 Over those 7 years, VFC gained 230% while the S&P 500 gained only 50%. Since July 2015, however, VFCorp stock price has been recording lower highs and lower lows, the very essence of a downtrend. But last week confirmed the possibility this downtrend is over and outperformance is back in a big way for this stock. It’s easy to see the drawdown from July 2015 through the February 2017 bottom, which filled the price gap from October 2013. The February 2017 low was also the 38.2% Fibonacci retracement of the entire move from the November 2008 low to July 2015 high. Price discovery is not random guys. We see price work like this over and over again across any liquid investment vehicle with a tremendous amount of memory from the past. Whenever we enter a trade, priority number one is risk management. We need to know when we’re on the wrong side of the trade. For us, it makes sense to own VFC above $55.75. Below that, and we’ll let the market have it. This particular set-up has a reward to risk ratio of almost 5 to 1. The reward is asymmetrically skewed in our favor. We like that. To conclude, the weight-of-evidence suggests higher prices for VFC. The simple yet prudent game plan is to own this fashionable stock above $55.75. Trade at your own risk. The importance of the $99-100 level can be clearly seen. Sellers showed up twice at that level in 2015 making the breakout at the end of 2016 notable. However, since the highs in January, selling pressure has returned. The increase in supply has created a false move. From false moves come fast moves in the opposite direction. The fast move in the opposite direction is taking place right now. We don’t need to predict. Price shows us there’s no need to be a buyer of U.S. Dollars right now. In conclusion, the Almighty Dollar, an important piece of the market puzzle, needs to prove itself before we’d consider a long position. If the selling continues, we’d expect buyers to show up near the $92-93 handle, an area where they showed up in the past (see green annotated arrows in the chart above). Since many market pieces are priced in Dollars, this current move could have an impact across a variety of assets, including commodities and foreign equity markets. AND, you’ve got FREE access to an investing tool we’ve created, The Ultimate ETF Cheat Sheet. Click this link to get your FREE easy-to-use resource guide for all your ETF needs.